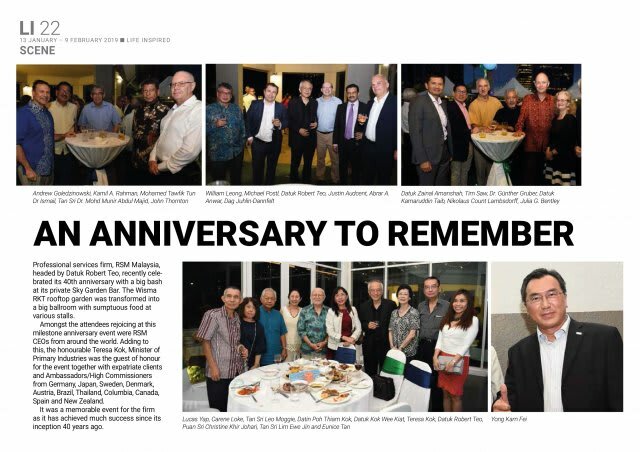 Professional services firm, RSM Malaysia, headed by Datuk Robert Teo, recently celebrated its 40th anniversary with a big bash at its private Sky Garden Bar. The Wisma RKT rooftop garden was transformed into a big ballroom with sumptuous food at various stalls. Amongst the attendees rejoicing at this milestone anniversary event were RSM CEOs from around the world. Adding to this, the honourable Teresa Kok, Minister of Primary Industries was the guest of honour for the event together with expatriate clients and Ambassadors/High Commissioners from Germany, Japan, Sweden, Denmark, Austria, Brazil, Thailand, Columbia, Canada, Spain and New Zealand. It was a memorable event for the firm as it has achieved much success since its inception 40 years ago. This article was extracted from Star Life Inspired.